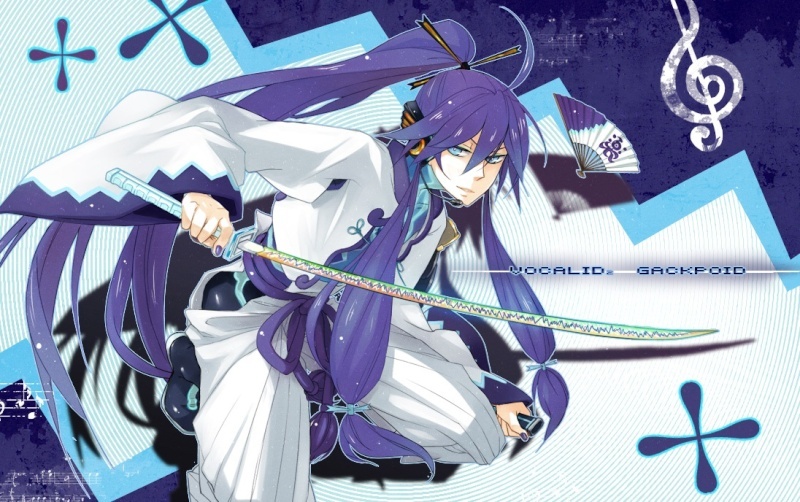 Personality: Gakupo is seen as a peaceful male, usually sporting a smile and polite words. Not only that, but as a samurai, he holds a peaceful sense of honor, which clashes with his species role, and usually tried to uphold it if he can. Because of his fine looks, Gakupo is also rather vain, and will back this up should he have to, or when he feels the time is right for it. yet, despite this, he isn't obnoxious about it. His high views of himself stem from the fact that he's quite a lady killer. It's rather well known that he an sweet-talk and sweep almost any girl off their feet and straight into his warm, welcoming arms. This often gets him into a lot of trouble with the Earl. Passed his self-loving air, he is a surprisingly polite young man, and is usually willing to delve in any type of conversation. He is very approachable, which makes him seem more human then Akuma, and welcomes almost any company. Appearance: usually, he wears a classical samurai like attire. 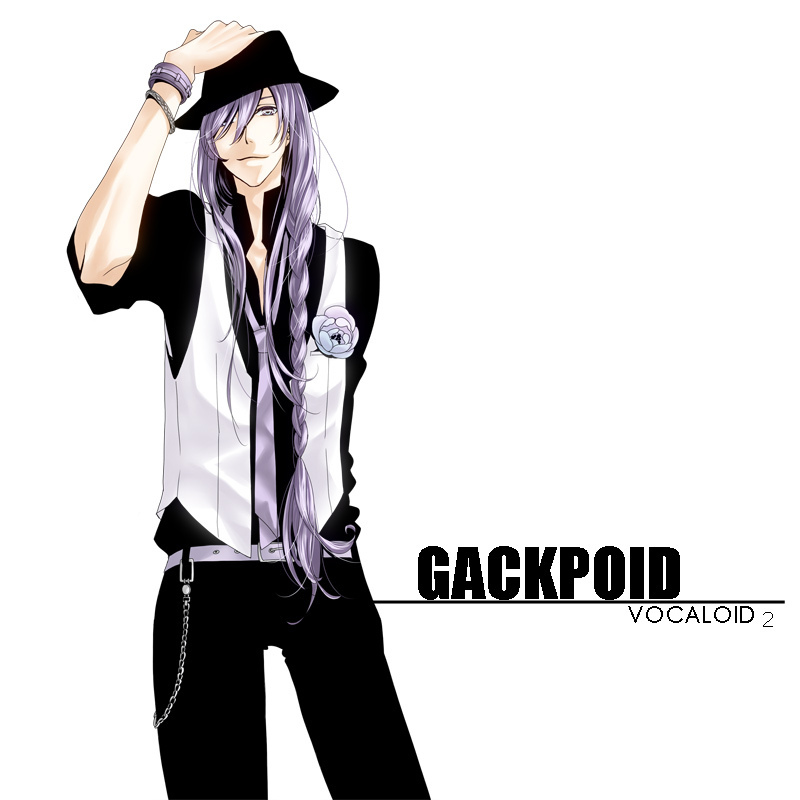 To match this choice of attire, Gakupo has classically beautiful features, and often sports a calm smile. He usually wears his purple hair up with a red and black x-shaped Japanese clip, though it still falls back passed his backside. Two long locks are placed on his front, and are ended with two light blue ribbons. He also wears a pair of headphones. They loop around the back of his head, and cover his ears, they are black and glowing red. To go with his oriental style, he wears white hakama pants, with a purple sash fastened around the waist, and a white haori jacket, the sleeve cuffs trimmed with a zigzagged-pattern of purple and light blue. On the upper left sleeve of the jacket is a slab of electronic armor, and on his hip a sheathe containing his sword. He is often seen with a fan, that is mostly white with the upper right side colors being purple and light blue. A musical symbol is on the center of the fan. He also has his finger nails, which are grown to a medium length and rounded squared, painted purple. Occasionally, however, there will be times when he chooses not to dress like this, and will take more modern garbs. This usually is something still formal - suit and tie, though said suit will sometimes be disheveled, or even classical Victorian-style wear. His casual wear is still stylish, though much more grungy than anything else, consisting of jeans -- or leather pants -- and a half shirt. Akuma Appearance: In his true form, Gakupo's only significant changes are that he leaks a dark purple aura around himself, covered in eyes that seem to peer out at all those around him. 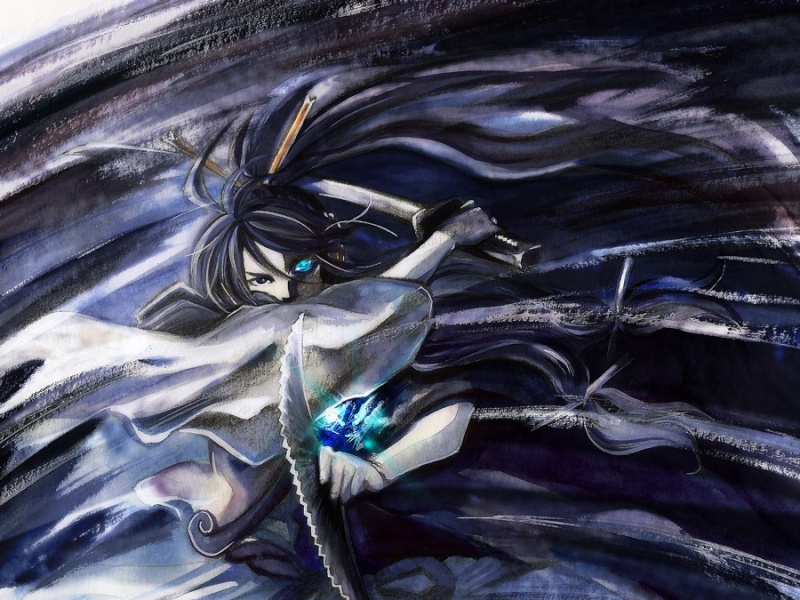 Akuma Abilities: Most of Gakupo's abilities are Air and Sound based, making him a primary candidate for intense combat. 1. Sonic screech: His most basic sound technique is a sonic screech released from his hands, but can also be released from other areas of his body, such as his feet and mouth. 2. Sonic Cutter: Using sound waves, he can create a sound wave infused with air, strong enough to slice through the toughest materials with ease. This technique is usually deployed with his finger tips, or the sword he carries with him. But, it can also be used as a ranged attack. 3. Blasting Stereo: Using sound waves, Gakupo sends out a mass amount of them, causing large bursts of wind forward. This technique is usually used to repel enemies, and stop projectiles. It is even capable of stopping beams of energy and is very hard to get around, as it will repel attacks most of the time. 4. Sound Impact: This is a melee technique, where he either uses his fists, or his sword to strike the enemy. After landing a successful hit, even a scratch, he sends sound waves into the enemies body and completely paralyzes their bodies for short moments of time. This is done by the sound waves disrupting communication of the nervous system, which causes them to freeze. 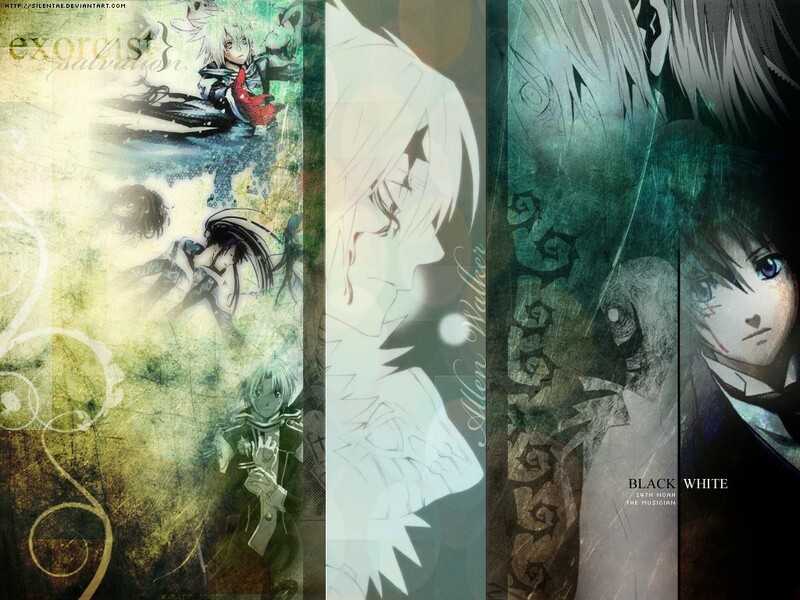 The only ways to get rid of it fully, is to injure oneself. Otherwise, it will leave a lasting effect of up to a week. 5. Fury Cutter: After infusing his sword with the wind element, he can cause multiple slashes with a single slash. This is done by causing 3 winds to mimic his slashes at different angles from around him. This makes him an extremely versatile swordsman, as it usually isn't expected by enemies. 6. Step Slash: Taking one step, Gakupo uses the wind to push himself forward at a blinding speed, and slash at the opponents. This technique can be used in combination of other abilities, and in the air, giving him fast air combo abilities. 7. Flight: Gakupo is capable of acrobatic flight, and seems to be much faster in the air then he is on the ground. When flying, he will typically show off and perform rather amazing acrobatic fleets. Reason of becoming Akuma: Gakupo attempted to revive his dead lover, but instead ended up becoming an Akuma himself. Role-play Sample: It's Yoite ._.